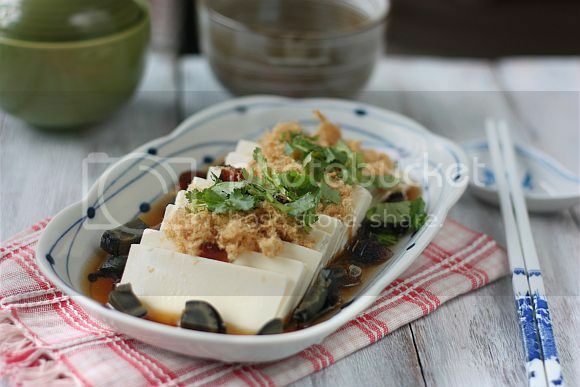 I regularly prepare chilled tofu dishes at home because it's easy to put together and it is delicious as well. There are in fact so many ways to prepare tofu and to me it is the perfect home-cooked comfort food. Tofu used to be only cooked in Asian homes or restaurants but now it is found all over the world. Western restaurants are now even incorporating this ingredient into their fusion dishes. 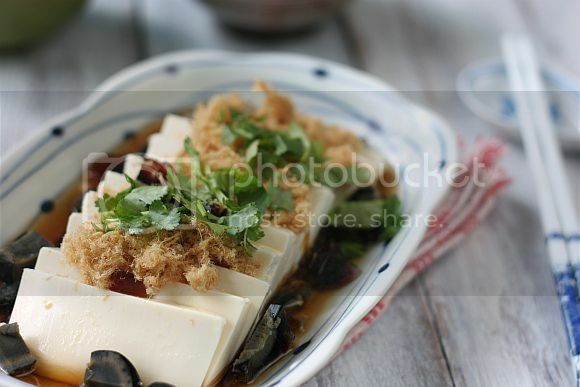 Discovered over 2000 years ago by the Chinese, tofu has on occasions been described as the "Cheese of Asia" because of its physical resemblance to a block of farmer's cheese. It is highly nutritious and is protein-rich as it is made from soybean milk. Tofu in fact is bland in taste and eaten on it's own is really not very tasty. Because it has such a mild taste it is most suitable for a wide variety of foods, from meat replacements in stir fry, stew or any other main dish to smoothies and desserts. Another great property is that it acts like a sponge and absorbs any seasoning or flavours you would add to the dish. That way you can marinade it and prepare it to taste any way you like. If you are a vegetarian or on a vegan free diet, tofu is the best possible food you could eat to obtain for your required protiens and nutrients. 1) Slice the tofu thinly and place on a serving plate. 2) Mix the seasoning together and pour over the tofu. 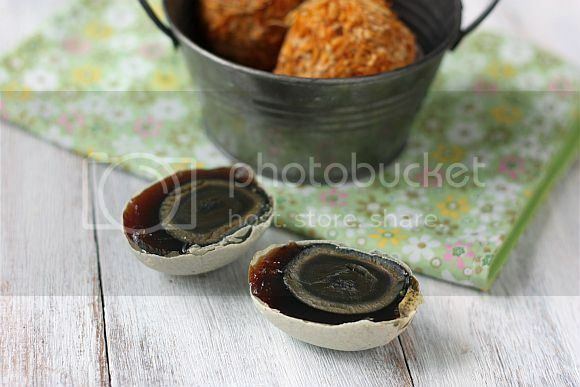 Arrange the diced century egg over and around the tofu. Add a pinch of black pepper. 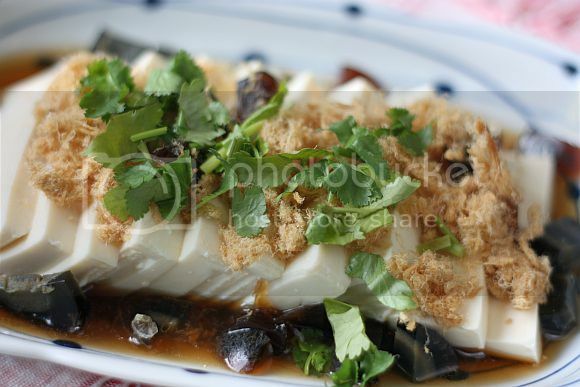 3) Then sprinkle the century egg, coriander and pork floss over the tofu. Serve immediately. Yum! I love tofu served anyways! Will try this when I have little time to whip up dinner. Thanks Jo! I just bought tofu. I'm looking forward to having it this week. Great recipe. Easy to make but it taste great! 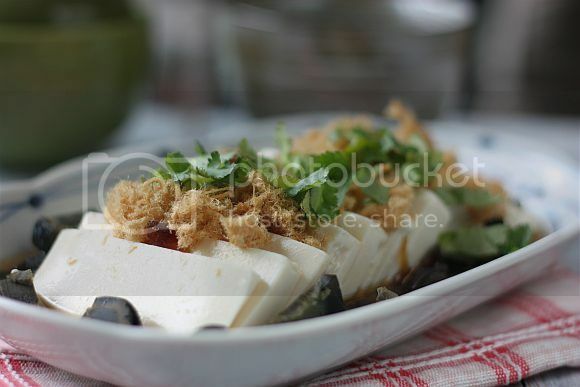 I love silky tofu prepared this way...you know, with lots lots lots lots of century egg ;-)) Yummy! I am fortunate that all these ingredients are available in Hong Kong very easily. The recipe is just perfect and the gorgeous presentation makes it even more appealing. I am drooling!! Bookmarked for sure! this is such a homely and beautiful appetizer. Simple and yet delicious! Like your blog. I have an award for you. Pls drop by and collect. a whole handful of my favorite chinese treats!! this looks great, your photos are very beautiful.